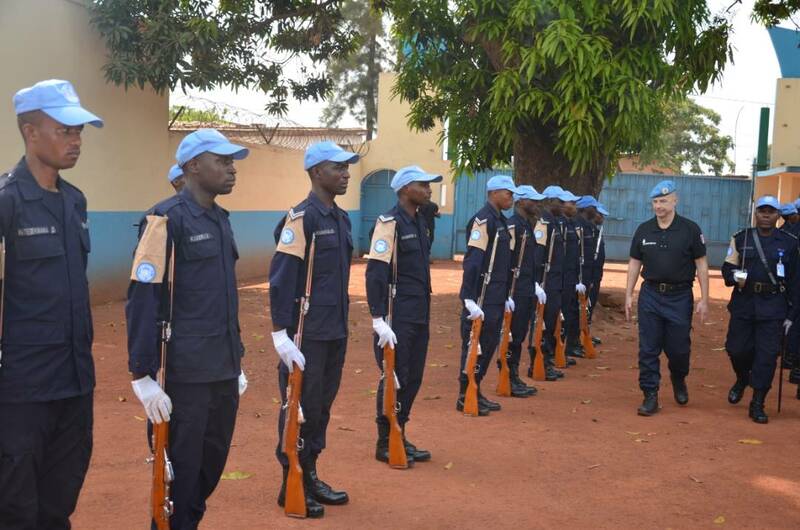 The Police Commissioner for the United Nations Multidimensional Stabilisation Mission in Central African Republic (MINUSCA) Gen. Roland Zamora, on December 24, visited the camp of the third Protection and Support Unit (PSU) deployed recently, and urged them to maintain the image set forth by their predecessors. The unit is manned by Rwanda police peacekeepers. Zamora, who was accompanied by other top MINUSCA officials, was received by the RWAPSU III contingent commander, Assistant Commissioner of Police (ACP) Emmanuel Hatari, who gave him an overview of the unit’s capacity and readiness and the contingent’s own equipment. The presentation by the contingent commander tackled areas of training, operations and some challenges especially those related to infrastructure the Rwandan contingent has encountered since they arrived in CAR early this month. The PSU composed of 140 officers is among the three contingents of 140 officers each that replaced the same number in MINUSCA in a rotational exercise conducted early this month. “It is a tradition of the UN to welcome new peacekeepers, but let me also mention that since the start of MINUSCA mission, Rwandan peacekeepers have been performing their duties exceptionally well, so we expect you to maintain that legacy and even do more…we have no doubt about that,” Zamora said. Meanwhile, the Rwandan Formed Police Unit (FPU) in Haiti shared their Christmas joy with children residing in the surroundings of their camp, where they shared dinner on the eve of the Christmas Day. The Christmas party for the children from vulnerable families was also attended by their parents and local leaders. Local leaders and parents, who spoke at the event, thanked the Rwandan police peacekeepers for their humane and for instilling the ideals of human security development and being friendly to the people. The Rwandan Police peacekeepers in Haiti under RWAFPU8 is also composed of 140 officers under the command of ACP Yahaya Kamunuga.